Google Duo is the next big thing announced at Google I/O 2016 developer’s conference. 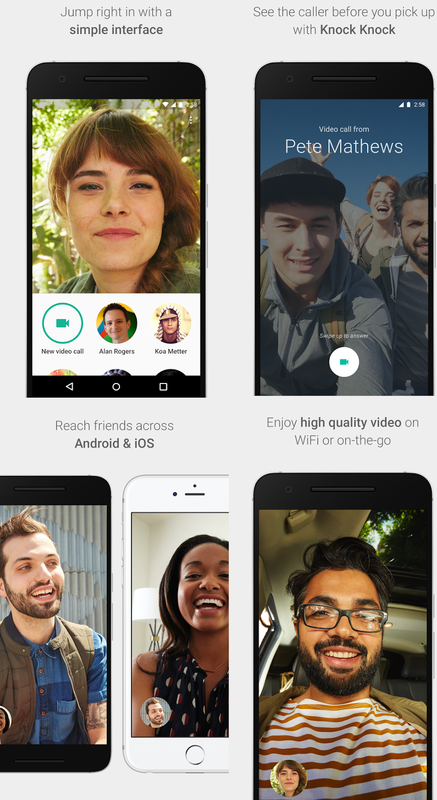 Duo by Google is the latest cross-platform one-to-one video calling application, designed and developed in a simple way to provide reliability and fun to make moments unforgettable. Google Duo for Android, iPhone, iPad and iPod Touch is available for smartphones and tablets powered by Android and iOS mobile operating systems. The Free Direct Download Link of Google Duo APK for Android is available below. One-to-one HQ video calling to friends, families and office workers in simple, reliable and fun way. It provides pre-video preview to whom the call is made, so that caller can see who is calling. With high quality and high definition video calls, users can feel faster and reliable experience with Wi-Fi and internet data plan. Duo is a cross-platform app to get in touch with all friends on Android and iOS without limitation. Google Duo video calling application is also available on Google Play Store officially, and as well as through independent third party links, as shared and posted in this post. All Android users must ensure to enable security check i.e. "Allow installation of apps from unknown sources" available in device settings.